We offer two distinct levels of service, depending on your budget. Both of our services include: Coaches [all fully seat-belted] which stay with you from the moment they arrive at school on your first day, taking you to your chosen venues throughout your visit, and returning you to school on your last day. Ferry transport from Portsmouth to Fishbourne or Lymington to Yarmouth using the services of Wightlink Ferries. Should you prefer, we can arrange for you to travel by hovercraft, catamaran or private motor launch. Good hotels chosen for their suitability for school parties with a (home from home) atmosphere, so important to young people. Full board accommodation [including packed lunches] commencing with evening meal on the day of arrival and ending with packed lunch on the day of departure. Medical/ethnic diets are catered for as necessary, although, in the case of excessive requirements, hoteliers reserve the right to levy additional charges at their discretion. The services of our efficient and friendly staff who take care of every aspect of organisation and administration including making your appointments for places of interest, excursions and sporting activities. We are always available to offer any advice or assistance you may require with the compilation of your itinerary. 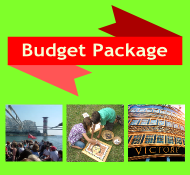 If you are unfamiliar with the Isle of Wight, our experience can prove invaluable in helping to tailor a programme to complement your classwork. A party night, usually in the form of a disco in the hotel - what better way to end an enjoyable visit! Written Risk Assessments - prepared by the owners/operators of places of interest/activities will be provided - where available. For some example itineries, please see here.